art of sword making on its head. Near silence reigns in sword maker Chen Yuan-fan's small workshop--there is neither the roar of a forge nor the bangs of hammer-and-anvil in this 10th floor apartment in downtown Taichung City. The noisiest machines to be found here are the belt-sander and a grinder--the primary tools in the so-called stock-removal method of making sword blades. It is a method that is more self-explanatory than it sounds. "Simply speaking, while a bladesmith heats up a piece of steel and hammers it into a blade, a stock remover takes a piece of steel and grinds off everything that isn't a blade," says Chen, who notes that both methods have their pros and cons. For centuries, the sword has played multiple roles: a weapon, a symbol of honor, a sign of rank and power, even an agent of ritual in religious ceremonies. True, the sword's role today is diminished, having been replaced by firearms in the battlefield, but it continues to maintain a unique place in Chinese culture, and is featured in popular novels, in TV drama series and traditional operas, in temples and religious ceremonies, and in parks, where people can be seen practicing fencing as a morning exercise. That said, swords are naturally not as widespread as they once were, and the methods for making them are also changing. In times past, bladesmiths relied on forges and hammers to craft their creations, heating metal in a forge to the point that the metal becomes malleable, and then hammering it into shape on an anvil. This process, which compresses and realigns the metal's structure, increasing the durability of the blade, is what gives a blade its shape and edge, before a grinding stone is used to refine the sword. But, as Chen points out, it is a process that is fraught with difficulties. Forging, in the old days, was the only way to produce quality blades, but the process also had its share of failures. Factors such as the method of hammering the metal and the temperature of the furnace can all have an effect on the successful--or otherwise--outcome of any given blade. Life is made easier by modern factory methods, which consistently produce metal that is as good--if not better--than the old forged-by-hand variety. In theory, blade makers can buy factory steels, fashion them into blades and then put the blades through a rigorous process of heating, cooling, and reheating, all of which changes the composition of the metal. The catch is that longer blades tend to bend when they are being cooled and reheated. It is a technical sticking point that has deterred many blade makers from making the transition from forging to using factory-made metals. Chen, who believes he is the only swordmaker using this process, has circumvented the problem by designing a special ceramic clamp. 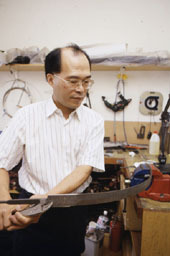 Chen's interest in sword making started 25 years ago, when he came across an old, broken Japanese sword and tried to regrind it, an experience that changed his life. "It was impossible to make a living by making swords at the time, but I spent as much time and energy on the hobby as I did on my day job as a goldsmith," he says. "I guess this is one of those things--once you're in, there's no way out." Sword-making might well have remained a hobby, if Chen had not lost his job, six years ago, at the age of 44. "You can imagine how difficult it was for someone my age to start a new career with the economy the way it was," he says. "Truth is, I didn't have much of an option." After working as a designer for a local knife company for about a year, Chen began custom making swords, concluding that, as foreign makers of short and medium blades were already thick on the ground, he would concentrate on long blades. "The bad news was that the local market for custom swords was still small," he says. "The good news was that there were very few makers, so I didn't have to worry too much about competition." To promote his work, Chen submitted entries for, and won, several national-level awards, which began to attract customers, with whom he would discuss a basic design. Basing on the design, Chen then suggests the proper materials, draws the final draft, and then begins the job of cutting and grinding the blade into its basic shape, before sending the blade to the factory to be heat-treated to the desired hardness. "The harder the material, the sharper but more brittle the blade is," says Chen. "The key is to reach a balance between hardness and elasticity." Individual craftsmen have different opinions about what exactly the perfect balance is. Chen demonstrates how one of his swords can be bent 180 degrees and bounce back. He says that a Rockwell Hardness score of between 60 and 62 is ideal for long swords. By way of comparison, a Swiss Army knife measures 55 to 56 on the Rockwell scale. Once the heat treatment is completed, it is time for the detailed work--grinding, filing, sharpening, polishing, making the scabbard and the handguard, and assembling all the parts. Chen handles the entire affair himself, right down to the wood and leather work. A major selling point in a Chen-made sword is its decorative flourishes and the detail in its accessories, the sum of which Chen considers to be the most difficult part of the whole process. You might possibly learn to grind and polish a blade in a year or two, but the rest of the sword will take you at least five years to make, he says. In the meantime, Chen's swords are not for customers in a hurry. It takes at least six months to complete a basic piece, while a more ambitious effort could take several years. During the process, the customer is asked to come to the workshop several times to personally test the order's ergonomics and balance, and to look over every other detail of the blade. As for the price, production varieties that come in batches of 10 swords cost NT$180,000 (US$5,300), while custom blades start at NT$600,000 (US$17,700). Currently he is working on a piece that is encrusted with ruby and has a value of more than NT$10 million (US$295,000). That may sound like a lot of money for a piece of sharpened steel, but Chen admits that he targets only the top-of-the-line customers. "Most people can afford some cutlery, but not many can afford mine," he says. "It's like most people can afford a car, but only a few can afford a Rolls Royce." Whether he has lucked onto the right marketing strategy or because the economy is bouncing back, Chen's swords have been selling very well. That is good news for his students, whom he began to take on five years ago. Chen admits that in the early days of his business he saw classes as a safe way to ensure an income, but the passing-on of skills has become more important now that business is steady. "Many crafts disappear because craftsmen consider their skills professional secrets," he says. "But I can't let something I've spent more than 20 years on go to the grave with me." Perhaps Chen at work is a far cry from the old-world blade maker--the smith toiling alone at his forge, showers of sparks filling the air as he hammers at a blade--and it is unlikely his creations will ever go to battle, as they did in days past, but his dedication to his craft is no less fierce than in the days when a sword was more than just a sword.